Marc Minkowski and his Musiciens du Louvre, on tour in Europe, brought a pleasant surprise by performing Tchaikovsky’s The Nutcracker full-length in concert. The surprise was not so much to hear Tchaikovsky on period instruments (that has been done before by Jos van Immerseel and Anima Eterna, among others), neither that an ensemble steeped in the baroque and early classical repertoire ventures into late 19th-century music. No, this was purely and simply one of the finest readings of the ballet I have ever heard, in or out of the theater. Played by the French orchestra this Nutcracker sounded extraordinary, often thrilling, at times revelatory, yet it was above all Minkowski’s way with the score which made this concert such a standout. Part of the success stems from the fact that Minkowski conducts The Nutcracker for what it is: music for the theater. While much of the score can sound like an orchestral spectacular (and is often interpreted that way), this seemed like the last thing Minkowski had in mind. He rather was looking for refinement and character, and preferred to dig deep into Tchaikovsky’s sound-world. It didn’t matter either there was no stage action. When conducted with so much understanding and passion as here the score easily stands on its own and evokes a whole world of imagery and emotions. As a seasoned opera conductor Minkowski clearly knows how to tell a story and captured the changing climates of the score with total conviction. A French take on Russian music, but one that removed layers of dust and familiarity. The period instruments proved a tremendous asset to Tchaikovsky’s brilliant orchestration. As usual with Les Musiciens du Louvre the focus was essentially on the music, without a trace of sterile stylistic exercises in authentic performance. Textural transparency and refined orchestral balance, harmonic color and rhythmic flexibility all contributed to recreate this uniquely enchanting atmosphere that saves The Nutcracker from dreaded yuletide dirge and secures it a place as genuine masterpiece. Tender evocations of a child’s imagination contrasted with at times creepy passages of darkness. Even the opening numbers which are in the hands of many conductors merely to mark time, became small gems – none more than the Presto of No. 4 and the Grossvater Tanz in No. 5, theatrically heavy-footed and full of benign humor. No detail in the orchestration was left untouched and Minkowski wasn’t afraid to enhance the dramatic contrasts, yet without losing track of the musical flow. The long section opening with the Departure of the Guests, featuring the Battle with the mice and the Waltz of the Snowflakes was stunningly rendered. Minkowski knew exactly when and how to slow down. The orchestra bloomed in the Christmas Tree sequence, wonderfully paced, reminding that it doesn’t take modern strings to play in a passionate manner. Twenty girls from La Maîtrise des Hauts-de-Seine chorus provided beautiful vocal support in the Snowflakes – even when pressed rather hard by the slow tempo in the final section. I was never before so much aware that snow is gently falling down. Pure magic. In this respect it was regrettable that in the second part Minkowski somewhat changed the order of the score. As he announced during the short tuning break between acts, he preferred to open with the Pas de deux followed by the Divertissement and ending with the Waltz of the Flowers. The opening numbers of Act II – which offer some ravishing music – were dropped, as well as the first variation in the Pas de deux. Minkowski didn’t fail to stress the French influence on The Nutcracker and noted in passing that the celesta played by his orchestra was a French Mustel from the late 19th century, an instrument undoubtedly quite close to the one Tchaikovsky knew and introduced in Russia with this ballet. As it was, the Divertissement became a truly festive moment, totally apt as a brilliant culmination of the story. Very few conductors I heard in concert capture the character of the different dances with such accuracy. The Spanish dance was sparkling and colorful, the Arabian variation exuded the exquisite perfume of the Orient, and in the Trepak one could easily imagine boots stomping in the snow. Woodwinds and percussion were exquisite. Les Musiciens du Louvre are a superb formation indeed. They played like possessed and evidently had a great time performing this music. Solos were magnificent throughout, most notably from flutes, oboe and harp. The hard-working violins were divided left/right, with the four basses at the back center. A smaller than usual orchestra for Tchaikovsky when it comes to the strings, although judging from the balance and weight that Minkowski obtained, all it takes. Minkowski offered two encores from Georges Bizet’s L’Arlésienne, the Prélude and the introspective Adagietto, which he dedicated to the victims of terrorist attacks in France and Belgium from the last year. The solo saxophone was heard to great effect, but it was undoubtedly the link between the music of Tchaikovsky and Bizet, both great melodists and orchestrators, which was most exposed here. The Brussels Centre for Fine Arts was sadly half empty for this concert. The Nutcracker as a ballet is normally box-office safe. Yet many are probably still convinced that ballet music doesn’t stand much of a chance in a concert-hall. Minkowski and Les Musiciens du Louvre have disproven that, once again, completely. A superb concert. Categories: Concert reviews | Tags: ballet, ballet music, BOZAR, Casse-Noisette, celesta, La Maîtrise des Hauts-de-Seine, Les Musiciens du Louvre Grenoble, Marc Haegeman, Marc Minkowski, Nutcracker, period instruments, Piotr Ilyitch Tchaikovsky, Russian ballet | Permalink. 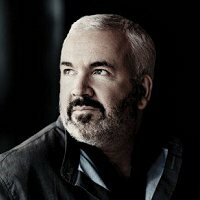 Marc Minkowski founded Les Musiciens du Louvre Grenoble 30 years ago. Under his direction the orchestra developed into one of the foremost period instrument formations of the day, focusing on Baroque, Classical and Romantic vocal and orchestral repertoire. Coinciding with their 30th anniversary they released the complete Franz Schubert Symphonies cycle on the French Naïve label. The project was filmed and recorded live at the Vienna Konzerthaus by the Austrian Broadcasting Corporation (ORF) in March of this year. 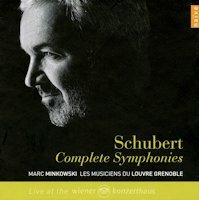 Categories: CD reviews | Tags: Franz Schubert, Les Musiciens du Louvre Grenoble, Marc Minkowski, Naive, period instruments, Schubert symphonies | Permalink.